I've always wanted to take a class on pattern fitting. I have had great success sewing clothes for my kids, but sewing for me? Not so much. I start out with great enthusiasm, only to end up in an endless cycle of misfitting muslins, typically losing interest before I even have a finished garment. I have a book, but for some reason looking at all those still photographs and reading the paragraphs underneath just doesn't do it for me. 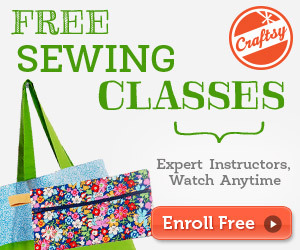 Yesterday, I received an email from JoAnn Fabrics with a link to a selection of online classes at Craftsy that are on sale for 50% off. I couldn't resist and I have purchased both Sew The Perfect Fit and Jean-ius Reverse Engineer Your Favorite Fit. I'm excited to take both classes and I hope learn enough to make some clothes for myself. Care to join me? Just click on any of the links above to check out these classes. Be sure to follow the Joann sale link to get 50% off. Now to replenish my splurge fund ... I decided to sign up as an affiliate with Craftsy. Yes, I'll be rolling in the dough when all 12 of you readers click on the links - ha!